This column was written by the editors of The Nation. The sharp escalation of the power struggle between Hamas and Fatah, ending with Fatah's sudden collapse and the seizure of power in Gaza by Hamas, is a tragic turn of events for the Palestinian national movement — but it's also bad news for Israel, even though some Israeli strategists mistakenly thought it was a good idea to foment civil strife. Although the conflict was abetted by Israel and the United States, neither should be happy with the results, which will vastly complicate the already dismal chances for a peaceful resolution of the wider conflict. The recent events are a shocking demonstration of the failure of Bush administration policy in the region. This disaster has many fathers. The steady growth of the Islamist movement cannot be understood apart from the long-term U.S. and Israeli strategy of undermining the secular Palestinian leadership. In 1993 PLO leader Yasir Arafat promised his people that the Oslo peace process would result in a Palestinian state. Instead, Israeli settlements rapidly expanded during the Oslo period, even as the Israeli closure policy — which began in 1993 and has never let up — shut off Palestinian workers from the Israeli labor market and limited freedom of movement inside the territories, resulting in severe economic depression. Popular disillusionment with the failures of Oslo helped bring about the second intifada in the fall of 2000. 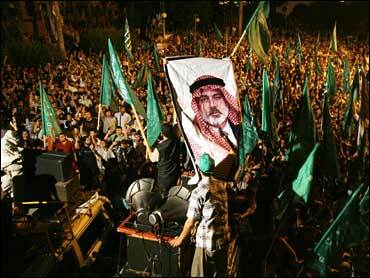 During that uprising, the Israeli government, blaming Arafat and the Palestinian Authority for violence, did everything it could to weaken the PA leadership. It continued that policy when Mahmoud Abbas was elected president after Arafat's death. Further undermining secular Palestinian leadership was its corruption and misrule. The gold-plated palaces of potentates like Muhammad Dahlan were a standing insult to a Gaza population mired in desperate poverty. The more direct cause of the Gaza mini-war lies in the Bush administration's cynical manipulation of "democracy promotion." This scheme has its origins in the attempts, five years ago, to push Arafat aside in favor of more pliable leaders, hence the steady calls from the administration for "reform" and elections. The Israeli government, with U.S. approval, imprisoned Arafat in Ramallah and then all but ignored Abbas, never pursuing serious negotiations or releasing prisoners, even as it continued construction of the separation wall and expansion of settlements in the West Bank. This further weakened Abbas and the secular leadership in the eyes of Palestinians. Ariel Sharon's disengagement from Gaza was carried out without any consultation with Abbas's government, which allowed Hamas to claim that Islamist resistance had forced the pullout. When elections were finally held early last year, Palestinians rejected the discredited Fatah slate in favor of Hamas, whose victory had far more to do with the Islamist movement's lack of corruption and record as a provider of social services — and its image of uncompromising resistance to occupation — than popular support for its ideology. Although the polling was remarkably open and democratic, the White House and the Israelis immediately set out to undermine the Hamas government through economic boycott and military subversion, funneling arms to Fatah militias. (According to recently retired UN special envoy Alvaro de Soto, the U.S. special envoy said earlier this year, "I like this violence," referring to increased fighting between Hamas and Fatah, because "it means that other Palestinians are resisting Hamas.") Many observers were surprised at the quick collapse of Fatah, assuming its superior numbers and weaponry would be decisive, but no amount of arms or numbers of men in uniform can make up for discredited leadership and lack of motivation among the rank and file. The plain fact is that more and more Palestinians have begun to see the clique around Abbas and Dahlan as sellouts, all too eager to accommodate U.S. and Israeli wishes. But the bloodshed has infuriated the population, and many are now disgusted with both Fatah and Hamas. What to do? First, it's high time to cast aside illusions. We cannot accept Hamas's ideology, and we reject the idea that "Islam is the solution" to political problems (the common formulation of Hamas and other Muslim Brotherhood-affiliated movements). But the United States and Israel must finally acknowledge that Hamas is a popular movement with deep roots in Palestinian society, and for that reason should be engaged rather than ignored. A key function of diplomacy, after all, is to negotiate with one's enemies; there would be little need for it if all nations and political groups were on friendly terms. It is commonly argued that negotiations are impossible because Hamas will not recognize Israel and is bent on its destruction. But Hamas leaders have repeatedly stated that they can live with a two-state settlement, or at the very least a long-term hudna (truce). Both Hamas Prime Minister Ismail Haniya and his political adviser, Ahmed Yousef, have made this point in op-eds in the past month. Yet Washington has quickly accepted Abbas's constitutionally illegitimate formation of a new emergency government. Further, it has promised to release massive amounts of aid and is reportedly pushing Israel to dismantle checkpoints on the West Bank and release prisoners, in this way hoping to facilitate a successful "Fatahland" on the West Bank that the Palestinians will compare favorably with a quarantined and boycotted "Hamastan" in Gaza. Israel should certainly ease pressure on Palestinians and turn over tax revenue owed them, and foreign aid is desperately needed. But any scheme to promote a more permanent division between the West Bank and Gaza, or to perpetuate Hamas's diplomatic isolation, is bound to increase tensions. And it can hardly bring about a viable peace agreement; arbitrary exclusion of a major, democratically elected Palestinian constituency in favor of malleable figures with little popular backing is doomed to fail. A more realistic policy, for Israel as well as the United States, would start with the assumption that only negotiations with a unified, more or less representative Palestinian leadership can lead to long-term resolution of the conflict. And there is a framework for such a settlement: the Arab League peace proposal, which offers full peace for full Israeli withdrawal from the territories. The promise to ease conditions in the West Bank should be matched with urgently needed aid to Gaza and an end to closure of the commercial exits there. Dismantling checkpoints, transferring tax revenues and releasing prisoners should be accompanied not by attempting to sow divisions among Palestinians but by encouraging a unified new leadership. Without such a leadership, negotiations are impossible. And with no hope for negotiations and an end to occupation, the misery and rage in the territories will only continue to fester. It has been said in recent years that the rise of Hamas would make Israel and the United States rue the day they dismissed Arafat. Let's hope further disintegration doesn't make them rue the day they dismissed Hamas.